Menu and the remote control. Design and specifications are current as of August 2005, but are subject to change without notice. * DLP, DLP medallion and TrueVision are trademark of Texas Instruments Inc.
* All company and/or product names are trademarks and/or registered trademarks of their respective manufacturers. 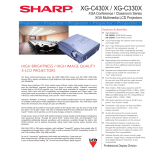 Sharp makes no warranties or representations of any kind with respect to these products. *1 The lamp life may vary depending on the usage condition.